Until about 1500 South Sudan was mostly controlled by speakers of Central Sudanic languages. Linguistic evidence shows that over time Nilotic speakers, such as the Dinka, Shilluk, and Luo, took over. These groups who currently live around the Sudd marshlands migrated down Southward from Northern and Central Sudan around the time of the collapse of Nubia and the strives that ensued among the many people who were ruled by the Kings of Nubia. Archaeological evidence shows that a culture based on transhumant cattle raising has been present in that area since 3000 BCE, and the Nilotic culture in that area may thus be continuous to that date. Archaeological evidence as well as the physical evidence in the livlihood of the Nilotes including their dome-shaped houses and tukuls shows that they may have made an enormous contribution to the governance and wealth of the Nubia Kingdom before and during the 25th Dynasty. A few Central Sudanic groups remain such as the Mari and the Moru. The Nilotic expansion seems to have begun in the 14th century. This coincides with the collapse of the Christian Nubian kingdoms of Makuria and Alodia and the penetration of Arab traders into central Sudan. From the Arabs the South Sudanese may have obtained new breeds of hump-less cattle. Archaeologist Roland Oliver notes that the period also shows an Iron Age beginning among the Nilotics. These factors may explain how the Nilotic speakers expanded to dominate the region. One theory is that it was pressure from the Shilluk that drove the Funj people north, who would establish the Sultanate of Sennar. The Dinka remained in the Sudd area, maintaining their transhumance economy. The Shilluk spread east to the banks of the white Nile by the 16th century under the legendary leadership of Nyikang, who is said to have ruled the Shilluk c.1490 to c.1517. The Shilluk gained control of the west bank of the river as far north as Kosti in Sudan. There they established an economy based on cattle raising, cereal farming, and fishing, with small villages located along the length of the river. The Shilluk developed an intensive system of agriculture, and the Shilluk lands in the 17th century had a population density similar to that of the Egyptian Nile lands. While the Dinka were protected and isolated from their neighbours, the Shilluk were more involved in international affairs. The Shilluk controlled the west bank of the White Nile, but the other side was controlled by the Funj Sultanate, and there were regular conflict between the two. The Shilluk had the ability to quickly raid outside areas by war canoe, and had control of the waters of the Nile. The Funj had a standing army of armoured cavalry, and this force allowed them to dominated the plains of the sahel. Shilluk traditions tell of King Odak Ocollo who ruled c. 1630 and led them in a three decade war with Sennar over control of the White Nile trade routes. The Shilluk allied with the Sultanate of Darfur and the Kingdom of Takali against the Funj, but the capitulation of Takali ended the war in the Funj's favour. 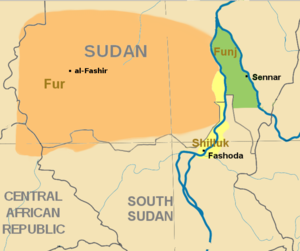 In the later 17th century the Shilluk and Funj allied against the Jieng, a group of Dinka who rose to power in the border area between the Funj and Shilluk. The Shilluk political structure gradually centralized under the a king or reth. The most important is Reth Tugo who ruled c. 1690 to 1710 and established the Shilluk capital of Fashoda. The same period saw the gradual collapse of the Funj sultanate, leaving the Shilluk in complete control of the White Nile and its trade routes. The Shilluk military power was based on control of the river. The non-Nilotic Azande people, who entered southern Sudan in the 16th century, established the region's largest state. The Azande are the third largest nationality in Southern Sudan. They are found in Maridi,Iba, Yambio<Nzara,EZon, Tambura and Nagere Counties in the tropical rain forest belt of western Equatoria and Bahr el Ghazal. In the 18th century, the Avungara people entered and quickly imposed their authority over the Azande. Avungara power remained largely unchallenged until the arrival of the British at the end of the 19th century. Geographical barriers protected the southerners from Islam's advance, enabling them to retain their social and cultural heritage and their political and religious institutions. The Dinka people were especially secure in the Sudd marshlands, which protected them from outside interference, and allowed them to remain secure without a large armed forces. The Shilluk, Azande, and Bari people had more regular conflicts with neighbouring states. In 1821 the Sennar Sultanate to the north collapsed in the face of an invasion by Egypt under the Muhammad Ali Dynasty. After consolidating their control over northern Sudan, the Egyptian forces began to foray south. In 1827 Ali Khurshid Pasha led a force through the Dinka lands and in 1830 led an expedition to the junction of the White Nile and the Sobat. The most successful missions were led by Admiral Salim Qabudan who between 1839 and 1842 sailed the White Nile, reaching as far south as modern Juba. The Egyptian forces attempted to set up forts and garrisons in the region, but disease and defection forced their quick abandonment. While claimed by the Khedives of Egypt, they had no real authority over the region. In 1851, under pressure from foreign powers, the government of Egypt opened the region to European merchants and missionaries. The Europeans found a large supply of ivory, but found the local Bari had little interest in anything they were selling. As a result the merchants often turned to force, seizing the ivory, even this proved not to be economical and the merchant ventures had little success. Christian missionaries also established posts in the region, with the Catholic Apostolic Vicariate of Central Africa, covering the region. The missionaries also had little impact on the region in the early 19th century. An illustration of Al-Zubayr Rahma Mansur from 1889. The lack of formal authority was filled in the 1850s by a set of powerful merchant princes. In the east Muhammad Ahmad al-Aqqad controlled much land, but the most powerful was Al-Zubayr Rahma Mansur who came to control the Bahr el Ghazal and other parts of South Sudan. Al-Zubayr was a merchant from Khartoum, who hired his own private army and marched south. He set up a network of trading forts known as zaribas through the region, and from these forts controlled local trade. The most valuable commodity was ivory. In previous centuries Sudanese merchants had not placed a high price on ivory, but the period of Egyptian rule coincided with a great increase in global demand as middle class Americans and Europeans began to purchase pianos and billiard balls. To manage the trade al-Zubayr needed labour, and thus also began to capture a significant number of slaves. To his mercenary force, he also conscripted a large slave army. Due to trade disputes with the Sultanate of Darfur al-Zubayr went to war against that kingdom and in 1874 defeated their forces and killed Ibrahim, the last Fur Sultan. The Khedive of Egypt, Isma'il Pasha, was concerned over the growing power al-Zubayr, and established the province of Equatoria and planned to colonized the area. Isma'il hired the British explorer Samuel Baker in 1869 to govern the area, and supplied him with soldiers and generous financing, but Baker was unable to extend Egyptian power over the area. To dispose of Al-Zubayr, Isma'il dispatched the mercenary leader Muhammed al-Bulalwi and promised him the governorship of Bahr el Ghazal, if he defeated al-Zubayr. Instead al-Zubayr routed the invaders and killed al-Bulalwi. In 1873 Isma'il thus agreed to appoint al-Zubayr as governor. Isma'il was still threatened by al-Zubayr and his independent base of power. The British media was also filled with stories about al-Zubayr the "Slaver King." In 1874 Charles George Gordon was appointed governor of Equatoria. In 1877 al-Zubayr travelled to Cairo to ask for the governoship of Darfur as well, but was placed under house arrest by Is'mail. Gordon defeated al-Zubayr's son, ending the merchants' control of the region. Despite this, Gordon still failed to exert authority over any territory in the region beyond the lands immediately around his few forts. In 1878, Gordon was replaced by Emin Pasha (Eduard Schnitzer). The Mahdist Revolt did not spread south to the non-Muslim region, but cut off the South Sudan from Egypt, leaving Emin Pasha isolated and without resources. He was rescued in a mission led by Henry Morton Stanley. Equatoria ceased to exist as an Egyptian outpost in 1889. Important settlements in Equatoria included Lado, Gondokoro, Dufile and Wadelai. In 1947, British hopes to join the southern part of Sudan with Uganda were dashed by the Juba Conference, to unify northern and southern Sudan. The region has been negatively affected by two civil wars since before Sudanese independence, resulted in serious neglect, lack of infrastructural development, and major destruction and displacement. More than 2.5 million people have been killed, and more than five million have become externally displaced while others have been internally displaced, becoming refugees as a result of the civil war and war-related impacts. In 1955, one year before Sudan achieved independence, the First Sudanese Civil War started, with aims of achieving representation and more regional autonomy. For seventeen years, the Sudanese government fought the Anyanya rebel army. In 1971, former army Lt. Joseph Lagu gathered all the guerilla bands under his South Sudan Liberation Movement (SSLM). This was the first time in the history of the war that the separatist movement had a unified command structure to fulfill the objectives of secession and the formation of an independent state in South Sudan. It was also the first organization that could claim to speak for, and negotiate on behalf of, the entire south. Mediation between the World Council of Churches (WCC) and the All Africa Conference of Churches (AACC) eventually led to the signing of the Addis Ababa Agreement in 1972, which established the Southern Sudan Autonomous Region. John Garang founded and led the Sudan People's Liberation Army/Movement through the Second Sudanese Civil War. In 1983, President of Sudan Gaafar Nimeiry declared all Sudan an Islamic state under Shari'a law, including the non-Islamic majority southern region. The Southern Sudan Autonomous Region was abolished on 5 जून 1983, ending the Addis Ababa Agreement. In direct response to this, the Sudan People's Liberation Army/Movement (SPLA/M) was formed under the leadership of John Garang, and the Second Sudanese Civil War erupted. Several factions split from the SPLA often along ethnic lines and were funded and armed by Khartoum, with the most notable being the SPLA-Nasir in 1991 led by Riek Machar. As a result of the infighting, more southerners died at each other's hands than were killed by northerners during the war. In the Bor massacre in 1991, an estimated 2000 civilians were killed by SPLA-Nasir and armed Nuer civilians and another estimated 25,000 died from the resulting famine in the following years. This war lasted for twenty-two years (until 2005), becoming the longest civil war in Africa. In 2005, Comprehensive Peace Agreement, mediated by the Intergovernmental Authority on Development (IGAD), as well as IGAD-Partners, a consortium of donor countries, was signed in Nairobi and autonomous Government of Southern Sudan was formed. This agreement lasted until 2011, when South Sudan declared independence. From 9–15 जनवरी 2011 people from South Sudan voted on whether they should break away from Sudan and declare independence. On 30 जनवरी 2011, the results had shown that 98.83% of the population had voted for independence from Sudan. At midnight on 9 जुलाई 2011, South Sudan became an independent country under the name Republic of South Sudan. On 14 जुलाई 2011, South Sudan became the 193rd member state of the United Nations. On 28 जुलाई 2011, South Sudan joined the African Union as its 54th member state. Certain disputes still remain with Sudan, such as sharing of the oil revenues, as an estimated 80% of the oil in both Sudans is from South Sudan, which would represent amazing economic potential for one of the world's most deprived areas. The region of Abyei still remains disputed and a separate referendum is due to be held in Abyei on whether they want to join North or South Sudan. South Sudan is currently at war with at least seven armed groups. According to UN figures, the various conflicts affect nine of its ten states, with tens of thousands displaced. The fighters accuse the government of plotting to stay in power indefinitely, not fairly representing and supporting all tribal groups while neglecting development in rural areas. Joseph Kony's Lord's Resistance Army (LRA) also operates in a wide area that includes South Sudan. In the SPLA/M's attempt to disarm rebellions among the Shilluk and Murle, they burned scores of villages, raped hundreds of women and girls and killed an untold number of civilians. Civilians alleging torture claim fingernails been torn out, burning plastic bags dripped on children to make their parents hand over weapons and villagers burned alive in their huts if rebels were suspected of spending the night there. In May 2011, the SPLA allegedly set fire to over 7,000 homes in Unity State. The UN reports many of these violations and the frustrated director of one Juba-based international aid agency calls them "human rights abuses off the Richter scale". In 2010, the CIA issued a warning that "over the next five years,...a new mass killing or genocide is most likely to occur in southern Sudan." Inter-ethnic fighting intensified in 2011 in Jonglei state between the Nuer White Army of the Lou Nuer and the Murle. The White Army warned it would also fight South Sudanese and UN forces. The White Army released a statement, to "wipe out the entire Murle tribe on the face of the earth as the only solution to guarantee long-term security of Nuer’s cattle." Activists, including Minority Rights Group International, warn of genocide in the current Jonglei conflict. In March 2012, the Sudanese Air Force bombed areas of the South Sudanese state of Unity, near the border of the Sudanese province of South Kordofan. South Sudanese forces responded by seizing the Heglig oil field on April 10. Sudanese troops launched a counter offensive and forced the South Sudanese Army to withdraw nine days later. On 20 अप्रैल South Sudan announced it had begun a phased withdrawal from Heglig, while Sudan claimed it took it by force. Afterwards, Sudanese president Omar al-Bashir held a victory rally in Khartoum. On 22 अप्रैल more fighting broke out on the border as Sudanese soldiers backed by tanks and artillery launched three waves of attacks six miles deep inside South Sudan. At least one South Sudanese soldier was killed and two wounded in the attack. The two parties recommenced negotiations in June 2012 under mediation by the African Union's envoy Thabo Mbeki. On 27 सितंबर Sudanese President Omar al-Bashir and South Sudanese President Salva Kiir signed eight agreements in Addis Ababa, Ethiopia, which led the way to resume important oil exports and create a six-mile demilitarised zone along their border. The agreements allows for the return of 350,000 barrels of South Sudanese oil to the world market. In addition, the agreements include an understanding on the parameters to follow in regards to demarcating their border, an economic-cooperation agreement and a deal to protect each other's citizens. Certain issues remain unsolved and future talks are scheduled to resolve them. At the same time as the ongoing General debate of the sixty-seventh session of the United Nations General Assembly on the same day, South Sudan was scheduled to speak. Vice President Riek Machar outlined what agreements were signed, but lamented the lack of a resolution on Abyei. In mid-March 2013, both countries began to withdraw their forces from the border area in a bit to creating a demilitarised buffer zone and resume South Sudanese oil production for export through Sudan. In early April South Sudanese oil started to flow through pipelines in Sudan again. Though Sudanese President Omar al-Bashir threatened to cut oil transit through his country from South Sudan, South Sudanese President Salvar Kiir accused him of mobilising for war and said that he would not go to war over the oil transit issue. On 6 जून 2011 armed conflict broke out between the forces of Northern and Southern Sudan, ahead of the scheduled independence of the South on 9 July. This followed an agreement for both sides to withdraw from Abyei. By late June, several international interlocutors including the United Nations advanced a proposal to base 4,200 Ethiopian soldiers in Abyei to serve as peacekeepers. President Salva Kiir alleged that on 14 दिसम्बर 2013, a (largely Nuer) faction of the Sudan People's Liberation Army loyal to former vice president Riek Machar attempted a coup d'état and that the attempt was put down the next day. However, fighting has continued. Machar denied trying to start a coup and called for Kiir to resign. At least 500 were reported to have died and over 400 injured. There are reports of people fleeing clashes in Bor, the capital of Jonglei state. ↑ Ogot, B. A., संपा॰ (1999). "Chapter 7: The Sudan, 1500–1800". General History of Africa. Volume V: Africa from the Sixteenth to the Eighteenth Century. Berkeley, CA: University of California Press. पपृ॰ 89–103. आई॰ऍस॰बी॰ऍन॰ 978-0-520-06700-4. ↑ अ आ "Deadly clashes on South Sudan's path to freedom". time.com. 12 फ़रवरी 2011. अभिगमन तिथि 21 दिसम्बर 2013. ↑ "Riek Machar in tears as he admits to 1991 Bor massacres". thelondoneveningpost.com. 16 अगस्त 2011. अभिगमन तिथि 20 दिसम्बर 2013. ↑ Fick, Maggie (30 जनवरी 2011). "Over 99 pct in Southern Sudan vote for secession". USA Today. Associated Press. अभिगमन तिथि 30 जनवरी 2011. ↑ Martell, Peter (8 जुलाई 2011). "बीबीसी न्यूज़ – South Sudan becomes an independent nation". BBC. अभिगमन तिथि 9 जुलाई 2011. ↑ "South Sudan admitted to U.N. as 193rd member". Reuters. 14 जुलाई 2011. ↑ "UN welcomes South Sudan as 193rd Member State". United Nations News Service. 14 जुलाई 2011. अभिगमन तिथि 14 जुलाई 2011. ↑ "South Sudan Becomes African Union's 54th Member". Voice of America News. 28 जुलाई 2011. अभिगमन तिथि 28 जुलाई 2011. ↑ "South Sudan referendum: 99% vote for independence". बीबीसी न्यूज़. 30 जनवरी 2011. अभिगमन तिथि 30 जनवरी 2011. ↑ अ आ इ "South Sudan army kills fighters in clashes". अल जज़ीरा English. 24 अप्रैल 2011. अभिगमन तिथि 26 अप्रैल 2011. ↑ "Civilians dead in South Sudan battle". Associated Press. अभिगमन तिथि 8 जून 2011. ↑ "The LRA and Sudan". अल जज़ीरा English. 5 जनवरी 2011. अभिगमन तिथि 3 जनवरी 2012. ↑ अ आ इ ई "Sudan: Transcending tribe". अल जज़ीरा English. अभिगमन तिथि 30 अप्रैल 2011. ↑ "SPLA set fire to over 7,000 homes in Unity says Mayom county official". Sudan Tribune. 24 मई 2011. अभिगमन तिथि 9 जुलाई 2011. ↑ "Thousands flee South Sudan tribal conflict". अल जज़ीरा English. 3 जनवरी 2012. अभिगमन तिथि 3 जनवरी 2012. ↑ अ आ "United Nations urges South Sudan to Help Avert Possible Attack". Bloomberg Television. 27 दिसम्बर 2011. अभिगमन तिथि 3 जनवरी 2012. ↑ "Activists warn of "genocide" in S.Sudan's Jonglei conflict". Sudan Tribune. 16 दिसम्बर 2011. अभिगमन तिथि 2 जनवरी 2012. ↑ Sudan and South Sudan in fierce oil border clashes – बीबीसी न्यूज़ Africa. Published 27 मार्च 2012. Retrieved 27 मार्च 2012. ↑ "Sudan troops 'advance on Heglig oil field'". BBC. अभिगमन तिथि 13 जनवरी 2013. ↑ "South Sudan 'to withdraw troops' from Heglig oil field". बीबीसी न्यूज़. 20 अप्रैल 2012. अभिगमन तिथि 22 अप्रैल 2012. ↑ "Sudan launches attack into South Sudan's borders". The Daily Telegraph. 23 अप्रैल 2012. अभिगमन तिथि 22 अप्रैल 2012. ↑ "Sudan, South Sudan start first security talks since border clash". Reuters. 4 जून 2012. ↑ "Sudan and South Sudan sign landmark deal – Africa". अल जज़ीरा English. 27 सितंबर 2012. ↑ Bariyo, Nicholas (27 सितंबर 2012). "Sudans Sign Deals to Resume Oil Exports". The Wall Street Journal. अभिगमन तिथि 27 सितंबर 2012. ↑ "UN General Assembly General Debate of the 67th Session – South Sudan (The Republic of)". United Nations. 27 सितंबर 2012. ↑ "Sudan: Over 4,000 Ethiopian Troops for Abyei Peace Mission". AllAfrica.com. 27 जून 2011. अभिगमन तिथि 8 जुलाई 2011. ↑ "South Sudan opposition head Riek Machar denies coup bid". bbcnews.com. 18 दिसम्बर 2013. अभिगमन तिथि 18 दिसम्बर 2013.